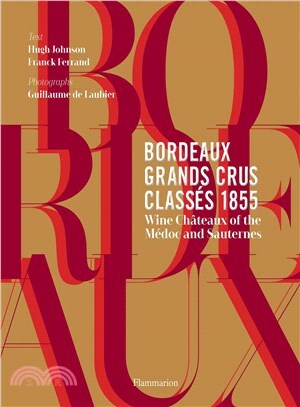 The landmark creation of the Grands Crus Classés in 1855 set the benchmark for wine quality around the world. The sixty-one reds of the Médoc and twenty-seven whites of Sauternes are considered the finest wines in the world. The care that goes into creating these exceptional wines is an art, and the picturesque domaines where this craft is perfected are as beautiful as their wines are refined. This is the first book dedicated to the red and white wines that offers the history of each domaine, along with a guide to the great vintages and an address book to the vineyards. Newly commissioned photographs capture the region throughout the seasons, making this handsome volume both a glorious voyage and an important reference for any wine lover. The wineries stand beside the stunning properties and belie the meticulous and magical work that they shelter, where a long line of elite winemakers fastidiously watch over the laborious tradition that has defined these exceptional wines for more than 150 years. A château’s history can be a riveting saga, but it invariably demonstrates that the splendor of great Bordeaux wines resides in perfect balance. Franck Ferrand is historian. Hugh Johnson is a world-famous wine expert, and Philippe Castéja is President of the Conseil des Grands Crus Classés in 1855. Guillaume de Laubier is a lifestyle photographer.